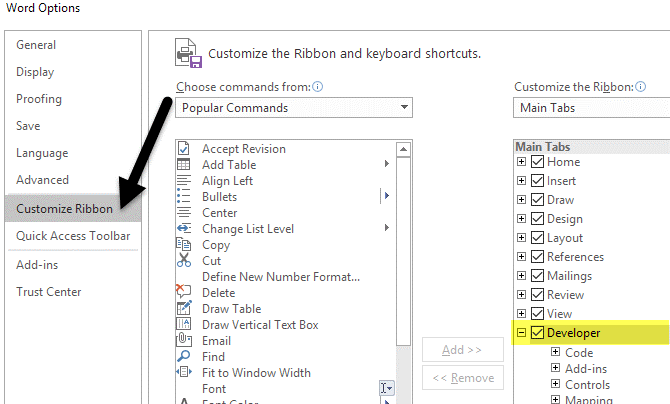 How to Create Fillable Forms in Microsoft Word can assist. From custom Microsoft .NET solutions, to Office 365 and SharePoint development, we can help. But if you're looking for a basic form for personal use, follow the steps below. When you hear about fillable forms, you probably think of Adobe and PDF documents. However, if you have Microsoft Office, you can achieve a similar result using MS Word. 1. Enable Developer Tab. Open Microsoft Word, then go to the File Tab > Options > Customize Ribbon > check the Developer Tab in the right column > Click OK.
A developer tab will populate. The Controls section has about eight different options that can be added to your Word document: Rich Text, Plain-Text, Picture, Building Block Gallery, Checkbox, Combo Box, Drop-Down List, and Date Picker. 2. Insert a Control. Click on the control and it will appear wherever your cursor was located. In the example below are two plain-text boxes inserted into a simple table for first name and last name. 3. Edit Filler Text. 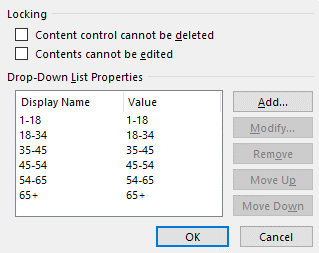 Customize the filler text for any control by clicking on Design Mode. Design Mode button again to exit the mode. 4. Customize Content Controls. Highlight your new form field and then click on Properties, directly below the Design Mode button. Here you can give the control a title, change the color, style the text and specify whether or not the control can be edited or deleted. At the very bottom are the control specific options, so if you have a plain text control set up, you can control how many lines you want to allow. 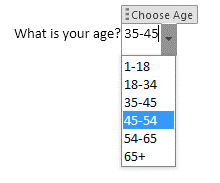 That last option is useful if you need someone to type in a paragraph of text. In a rich text control, you can change the font/color settings for each word individually, whereas the plain-text control will apply the formatting to all the text. 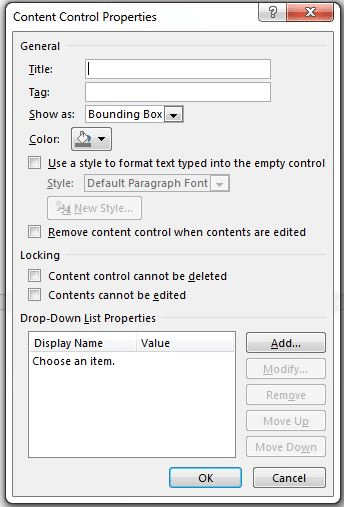 Plain-text controls do allow bold, font changes or color changes. If you need a drop down field added to your form go ahead and insert the drop down control. Highlight the field and again go to Properties to add your custom drop down options. By default, the Display Name and Value will be the same, but you can change it if you like. There really is no reason to change the value unless you are writing Word macros and refer to the controls in code. Hint: If your drop down field is not displaying make sure you are out of the Design Mode control. The only difference between the dropdown list control and the combo box control is that the latter allows the user to enter their own value. The date picker control works just like any date picker you have probably used before. 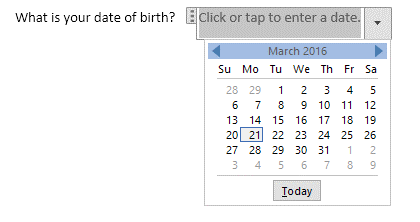 When you click on it, a calendar appears and you can simply click on the date to select it. Picture Control allows the user to upload or insert an image file easily. Bonus tip: Make sure you use tables to create well-organized forms. For more tech tips like this, click here, or learn about our IT support services for businesses. If you work for a business that needs to build form functionality into an existing processes or workflows, our team of custom application developers can assist. From custom Microsoft .NET solutions, to Office 365 and SharePoint development, we can help.